Prior to choosing this printer for homer office use it's crucial that you research the cost of replacement ink cartridges. While the initial purchase price of the printer may be low the cost of replacing the ink cartridges with genuine Epson inks may prove expensive. Compatible Epson ink cartridges are strongly recommended for this printer and are available for as little over €1 per cartridge. The Epson Stylus SX435W is one of the small units from Epson’s Small-in-one series. Like the other printers in the series, the Epson SX435W also boast many attractive and advanced features. It has a direct printing facility, memory card reader, WiFi connectivity, mobile printing etc. It is a dedicated home and small office printer with a small footprint. It is a compact device that measures only 145 x 390 x 300 mm. The printer has a flatbed scanner at the top. It also has a 3.6 cm colour display screen along with a basic control panel (with navigation and power buttons) at the front of the printer. The paper tray of the device can hold up to 100 plain paper sheets at a time. The printer uses Epson Stylus SX435W ink cartridges which are also available in Epson T1295 ink multipack. The Epson Stylus SX435W is a small all-in-one printer that fulfills almost all the requirements of home and small office users. It offers good quality prints at a decent speed. It also offers advanced features like wireless connectivity, direct and mobile connectivity etc. However, its low paper handling capacity and lack of fax and ADF functionality might disappoint the office users that deal with heavy printing tasks. Epson T1295 multipack; 4 colours. You can also pick EPSON SX235W ink multipack (T1295 multipack) to save more on your printing expenses. How to clean printheads of an Epson SX435W printer? If you find that the printout is faded or the dots are missing, you may be able to solve these problems by either replacing the Epson SX435W ink cartridges or by cleaning the print head, which ensures that the nozzles are delivering ink properly. You can clean the printhead from your computer using the Head Cleaning utility in the printer driver or from the printer by using the buttons. As the print head cleaning uses some ink from all Epson SX435W ink cartridges, clean the printhead only when the quality declines. For example, if the printout is blurry or the color is incorrect or missing. When ink is low you may not be able to clean the printhead. When ink is expended you cannot clean the printhead. Replace the appropriate Epson SX435W ink cartridge first. Right-click the printer icon on the taskbar, then select Head Cleaning. If the printer icon does not appear, refer to the following section to add the icon. The On light flashes while the printer performs the cleaning cycle. Never turn off the printer while the On light is flashing. Doing so may damage the printer. If print quality has not improved after repeating this procedure about four times, turn the printer off and wait for at least six hours. Then run the nozzle check again and repeat the head cleaning if necessary. If print quality has still not improved, contact Epson support. To maintain print quality, we recommend printing a few pages on a regular basis. Q. Why should I choose to buy your compatible Epson SX435W ink cartridges over the original ink cartridges? A. If you go for our compatible ink cartridges, you will reduce on your operating costs as compatible ink cartridges are way cheaper as compared to original ink cartridges, while being able to produce the same print quality as the original ink cartridges, so you would not have to compromise on quality either. Q. I do not use my printer often, so I do not have to replace my ink cartridges regularly. Due to this reason, multipacks are not suitable for me. I was wondering whether you provide individual Epson SX435W ink cartridges as well? A. Yes, we provide individual Epson SX435W ink cartridges of all colours. You can choose between the T1285 model and the T1295 model to use with your printer. Q. My Epson SX435W printer is displaying an error code “W-13”. What does it mean and how do I solve it? A. This error means that the ink pads of your printer are almost at the end of their service life and are required to be replaced. You can press the start button to continue printing for a while, but as the ink pads reach the end of their service life, the printer will stop printing pages. To replace the ink pads, you will need to contact Epson support, as it needs to be done by a professional. Q. How do I change the user interface language of my Epson SX435W printer from French to English? I am having trouble understanding anything. Select “Config” (Setup) on the LCD screen of your printer. Select “Configuration de l’imprimante” (Printer Setup). Find “English” from the list of languages and select it. Q. I have had bad experiences while using compatible ink cartridges from other suppliers. Will using your compatible Epson SX435W ink cartridges cause any problems to my printer? A. Absolutely not! Our compatible ink cartridges are of high quality that has been FSC tested and certified. They are designed to work well with your printer. We assure you that our compatible ink cartridges will work with your printer without any hassle. Q. For how long can I store unused EPSON SX435W ink cartridges (compatible) at home so that they remain in good condition for future use? A. You can store unopened ink cartridges for up to two years from the date of manufacture. For that, you need to store them in the standing upright position, away from direct sunlight and heat. Keep them in a sealed bag and in a cool, dark place. Q. Are EPSON SX435W ink cartridges suitable for Epson Stylus Office BX525WD printer as well besides EPSON SX435W? A. Yes, you can use these ink cartridges with the Epson Stylus Office BX525WD too. Q. I've shopped with you a couple of times before and have been happy with the experience. I need compatible EPSON SX435W ink cartridges in a multipack wherein I require more number of cartridges in certain colours. Will you be able to deliver them within 2 days accordingly? A. Thank you for your encouraging feedback. We're happy you liked shopping with us. You can buy the ink cartridges in a pack of 20 or 12 and also let us know the colours you require. If you place your order before 12 noon, we can deliver your product on a 1-2 day basis. And if you need any cartridges very urgently, please call us on 048 30833221 to check their status and discuss the same with us. 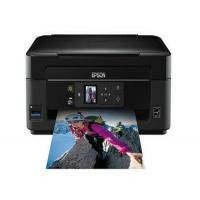 Q. I'm planning to purchase compatible EPSON SX435W ink cartridges for my home printer that I use for my own business. Do these cartridges cut printing costs substantively on colour printouts? A. You can save a great deal of money by purchasing compatible ink cartridges and rest assured you'll get best quality output while taking colour printouts too as they have been created using specially formulated dyes which also empower your printer to print for really long. Q. I have replaced my printer with new black ink and I put the ink in the right place. But error message is being displayed that ink cartridges are installed incorrectly. How to solve this problem? A. There are some simple troubleshooting steps that you can try to solve this problem. First, take out the Epson SX435W ink cartridge which is not being recognised. Put it to one side and switch the printer off at the wall. Leave the printer off for ten minutes to allow the printer to reset. After this if the cartridge is still not recognised, please contact Epson assistance support to solve the problem. Q. I bought these ink cartridges for my Epson SX435W printer. When I replaced them, the printer doesn’t print anything. Should I try out a new set of ink cartridges? Or should I check cartridges one by one to find if any of these is faulty? I have cleaned the heads and followed the instructions as given in the manual but it is still not working. What should I do? A. The cartridges listed on the page are guaranteed to work with Epson SX435W printer. The Epson SX435W ink cartridges you need for this printer should either have the codes T1281 / T1282 / T1283 / T1284. Or if they are of high capacity, they will have the codes T1291 / T1292 / T1293 / T1294. If you are sure that you have the right Epson SX435W ink cartridges then you can try out the following steps to resolve the problem. Remove the four cartridges from your printer and then switch it off for about five to ten minutes. Before reinstallation of these, clean the chips from these cartridges. If you are still getting the same problem then you must contact the supplier of the cartridges for further assistance. Q. Does the Epson SX435W printer have a usb port for connectivity? A. No, the printer does not have a standard flat type USB. It has a square printer type USB port. So you need a separate lead for connection to your computer. Q. I am making an yearly book for school which requires good quality photos in abundance. Which cartridges would you recommend me for my EPSON SX435W printer? A. We would like to recommend you the multipack of our compatible cartridges since they are extremely cost effective. We offer multipacks of 4, 8, 12 and 20 cartridges. You can choose and buy according to your needs from the following link: https://printerinkcartridges.ie/epson-inkjet-cartridges/epson-stylus-s/stylus-sx435w . Our compatible EPSON SX435W ink cartridges are made to deliver high definition prints with vivid and bright colours. These cartridges can also print on photo or glossy paper without fading away thus suitable for photo printing. Q. I wanted to know the ink quantity of these EPSON SX435W ink cartridges as I bought them recently and wasn’t sure about the ink quantity. A. The compatible EPSON SX435W ink cartridges contain 13mL ink while original cartridges have 5.9mL black ink and 3.5mL ink in other colour cartridge. You can also monitor the level of ink in your ink cartridges through the Epson status monitor on your PC which is a utility application that is accessible via the print dialog box or the control panel. I live in Poland and was keen on buying your compatible version of EPSON SX435W ink cartridges. A. No, we don’t deliver to Poland. We only delivers within Rep.Ireland & Northern Ireland. Q. I purchased a multipack of EPSON T1285 ink cartridges and placed it in respective slots. The printer is still showing an error message. What should I do now? A. When putting the cartridges in the slots make sure you keep the printer on. Switching the printer off would not detect the new cartridges. When you are ready to replace the ink cartridges go to printer’s setting/tools and select ‘replace ink cartridges’. Or if the printer is displaying an error - ‘Low Ink’ click on ‘OK’ or ‘Continue’, this will also lead you to cartridge replacement command. Once you place all the cartridges, close the cartridge access door and select ‘OK’. The ink light on printer will blink for a while and would stop once the printer is ready to print. Q. Can I pay for these EPSON T1285 ink cartridges when I receive my order that is, by cash on delivery ? Q. I always use your compatible version of EPSON SX435W ink cartridges for my printer. I was willing to refill the cartridges so as to avoid buying cartridges again and again. Do you provide refill kits for the same? A. The compatible version of cartridges we provide are re filled or remanufactured cartridges itself. We don't have refill kits. We would recommend you to buy compatible version of EPSON SX435W ink cartridges again as they serve same purpose as refill kits. Q. What are the paper formats supported by EPSON SX435W printer? A. EPSON SX435W supports the following paper formats: A4, A5, A6, B5, C6 (Envelope), DL (Envelope), No. 10 (Envelope), Letter, Letter Legal, 9 x 13 cm, 10 x 15 cm, 13 x 18 cm, 13 x 20 cm, 20 x 25 cm, 100 x 148 mm and 16:9.It is advisable to use the above mentioned formats only for optimum results.